The music on this album is inspired very specifically by William Blake’s The Book of Urizen, but not in a programmatic sense. The short pieces that make up the suite ‘do not represent the content of the poem literally or symbolically’, Tom DePlonty tells us on his website, and they require or assume no familiarity of the listener with the poem; what the music represents is DePlonty’s own affective response to Blake’s writing, and presumably to his art as well, the engravings being an integral part of the work of which the poem forms a part. 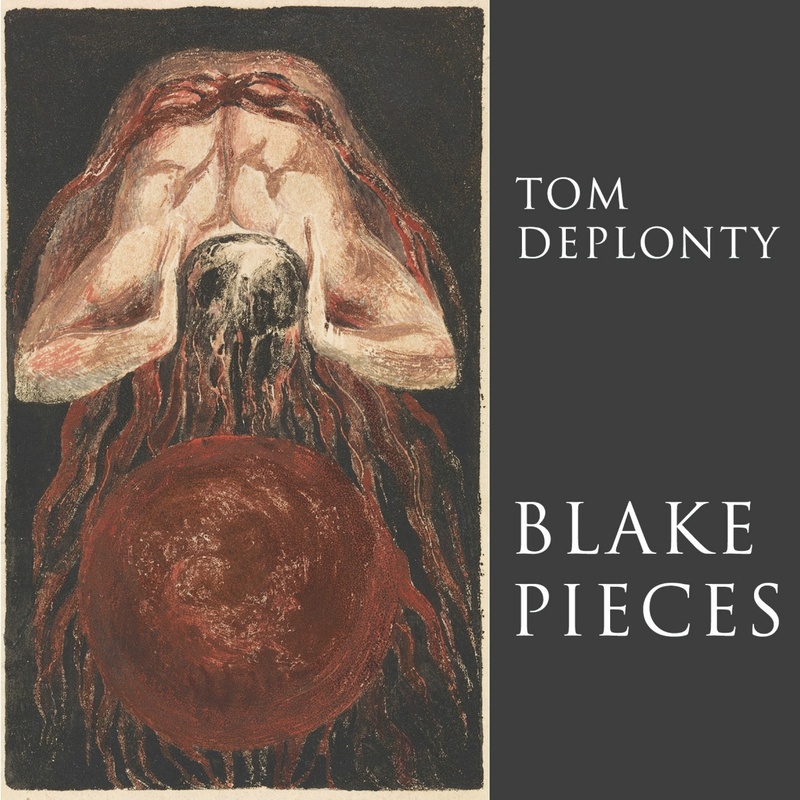 DePlonty is not a composer who employs a conventional musical language, however, and the distance between his formal means and more widespread conventions of aesthetic and affective signification potentially erects an additional layer of mediation between his response to Blake and the listener’s response to his music. He’s not made life easy for himself, but then, when was taking the easy road a viable route to making good art? What he has done is to create a set of very specific sonic utterances, statements whose particularity could in no way have been contained in second-hand vessels, and it is up to us to as listeners to learn his language, to parse the grammar of his sound-world, and to relate the atmosphere of his compositions to our own affective landscapes. That he tells us specifically that he intends to ‘reflect the tone and atmosphere of the poetry’ is a token of the terms on which we should take his work, not as an intellectual puzzle but as an experience; those listeners who are familiar with The Book of Urizen, as I have become while preparing to write this review, will relate that experience to the emotional impact of the poem, while those who are not must construct the sounds’ context from their understanding of DePlonty’s creative practice. Although the music is not literally programmatic, each piece is associated with a part of the poem, as indicated by its title; interestingly however, those titles do not draw a parallel between the music and the complete narrative of the poem, being drawn entirely from the final Chapter IX. Neither are the titles the initial lines of each stanza, although the dynamic peak of ‘Egypt’ is named for the revelatory concluding word of Stanza 6, and the swelling, ebbing, enveloping pulsations of ‘the salt Ocean rolled englob’d’ are titled for the concluding line of the entire poem. It’s safe to say that these lines must represent significant moments for the composer, but whether these decisions indicate that we should take the music as relating solely to this portion of the poem, or that we should assume any affective equivalence between these lines and the music they are attached to, remains fruitfully ambiguous. DePlonty began with a number of parameters for the suite: the pieces ‘would be purely electronic, without words … use (almost) no pianos, use many samples of natural sounds, [be] fairly short, and follow a planned sequence of more energetic and quieter pieces.’ Whether his ‘planned sequence’ corresponds to a narrative of intensity in his response to the poem he does not tell us, but this may explain the specific lines used in the pieces’ titles. However, I don’t propose to interrogate the album for some specific key to the relationship between its atmospheres and their inspiration, as I think DePlonty has told us fairly clearly that such an investigation would be fruitless, and I see no reason not to take him at his word. Having determined not to use pianos, DePlonty makes prominent use of organ sounds; this is, granted, another keyboard instrument, but it is not employed in such a way as to exploit the performative facility that implies, being used rather as an abstracted sound source, small selections of notes being employed in expositions of rhythm and texture. Given his intention to use ‘natural’ sounds I would guess that the bell or chime-like sounds in ‘small like the eyes of a man’ derive from a physical acoustic source, but other than these two examples I can’t really ascribe an origin to his sounds. Their sources may be ‘natural’, but their final expression is not representational, and although there is a degree of noise, a sense of random warmth to their timbres, I wouldn’t have raised an eyebrow had he told me that they found their genesis in the guts of a synthesiser. The processing of his sounds is a large part of his creative practice, and irrespective of their origins, this is, and sounds like, an album of electronic music. The peaks of activity in Blake Pieces come at the outset, with ‘the dark Net’, and at the halfway point, in ‘Egypt’. These are the two organ pieces, in which short, consonant phrases are subjected to a number of overlapping rhythmic transformations, sounding at times chaotic, at others orderly, and sometimes even feeling funky; ‘their eyes could not discern’, which follows ‘Egypt’, is also very active, being built around rapid, skittering, percussive sounds, but it is a dynamically restrained piece, and after the brazenly strident sound of the organ, its mechanistic repetitions sound positively contemplative, creating more of a granular continuity than a powerful sense of activity. Continuities characterise most of these pieces, which could largely be described as ‘ambient’, although to reduce their textures and sonorities to that term, without attending to their detailed timbral manipulations and nuanced transformations, would be to elide most of the work that has gone into this suite of music. Long tones are often very smooth and attractively reverberant, but they are frequently accompanied by gritty sounds, as though of dusty electrical devices, or by washes of white noise or perhaps the sounds of wind and water. Harmonies are simple, and they are usually consonant, tension entering the music by other routes than the blunt instrument of obvious, jarring dissonance. Places and spaces are evoked for me, as they usually are by music that eschews the narrative imperative of strong rhythmic cyclicities; that particular moods prevail in these spaces is what defines them, what renders them meaningful (or indeed present at all), and those moods of course are the central meanings of the work. It is those evocations of atmosphere that bring us back to Blake, if that is how we choose to hear the music. The Book Of Urizen is modelled on Genesis, and has been described as a parody thereof, although it is not obviously satirical in character. It describes the creation of the universe, and humanity’s fall from grace, in rather modern terms, as operations of human consciousness. Blake anticipates both a sort of New Age, pan-spiritualist perspective (the fall as a retreat from self-awareness rather than a morally structured exile from paradise), and the structuralist notion (also a basic assumption of post-structuralist perspectives) of a fundamentally linguistic ontology. His ‘dark Net’, as referred to in the opening piece’s title, is religion, which Blake regarded as a rigid, rule-based perversion of the spiritual, a mistaken division of existence into material and divine, and a structure by which humanity is deceived and enslaved; ‘[p]risons are built with stones of Law, Brothels with bricks of Religion’ is one of his Proverbs of Hell. The Book of Urizen, then, depicts the construction of subjectivities which separate the human mind from the divine, not in the sense of an active, supernatural, personalised deity, but as a condition of human (self) awareness. He does this allegorically, through the use of his elaborate constructed mythology, and it is from this that the immense affective power of his work derives. The very subtle and nuanced way in which DePlonty manipulates timbre can be heard as analogous to the particularity and precision of Blake’s verse. The quieter pieces, such as ‘the seventh day’, possess a quality of dim, precarious suspension, which while not equivalent in any obvious way, evoke a similar set of resonances to the dramatis personae of Blake’s mythology, groping blindly in an enveloping void which is rarely referred to but always present. To note that the suite’s peaks of activity are linked to sections of the poem in which a false, rule-based order is imposed, while the more contemplative moments in the music could be connected to moments of reflection or response in the poem, may be of no particular relevance, given the composer’s caveat on hearing any literal equivalence, but The Book of Urizen shares with Blake Pieces a distinct sense of quietly epic melancholy. However, the two works, whose textual relations offer one source of interpretation of the music’s meanings, are not of a piece, and DePlonty’s composition is quite self-sufficient in relation to the poem. Blake’s piece is overtly critical, and in some sense quite pessimistic, imagining as it does a historically distant cause of a perceived present dysfunction; DePlonty’s work, in a non-denotational medium, offers an affective richness that encompasses both Blake’s negative analysis and the positive worldview that informs it, bringing to the surface the tacit as it submerges the explicit. It is an appropriate homage to Blake’s creative insights that the music should unify this duality; if the disjuncture between human body and spirit is that of a house divided against itself, then Blake Pieces offers an affective landscape in which that disunity may be apprehended in its entirety, not mended but encompassed, pain and joy permitted to constitute rather than to contradict one another. To describe this suite of compositions as presenting ‘the rough with the smooth’ would be a brutally crass simplification; it presents a form of experience in which the one is unthinkable without the other. The only possible response to Blake’s unparaphrasable writing is a further articulation of experience; DePlonty offers one that is both whole, and ‘divided in form of a Human Heart’.